Looking for easy and delicious recipes for your next casual get-together? 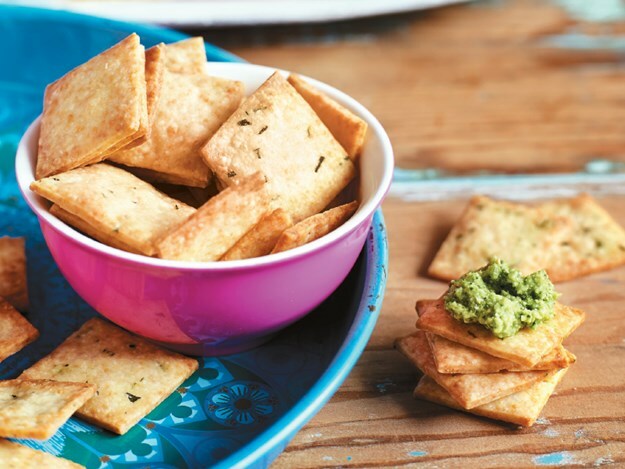 Check out Julie Goodwin’s parmesan crackers recipe. Preheat the oven to 200°C (180°C fan-forced); and line an oven tray with baking paper. Break the block of parmesan into three or four pieces and place in the bowl of a food processor. Blitz until powdered. Add the remaining ingredients and blitz until it comes together in a dough. Place a large piece of baking paper on the bench; place dough on top and cover with another large piece of baking paper. Roll the dough out to about 3mm thick. If the dough is too soft to work with, put it in the fridge for half an hour or until it firms up. Prick the dough all over with a fork and use a sharp knife or a pizza wheel to cut the dough into 4cm squares. Lift the squares with an offset spatula or palette knife and place, 1cm apart, onto prepared tray. Bake for 12 minutes or until golden. Allow to cool on the tray for a few minutes before transferring to a wire rack to cool completely.